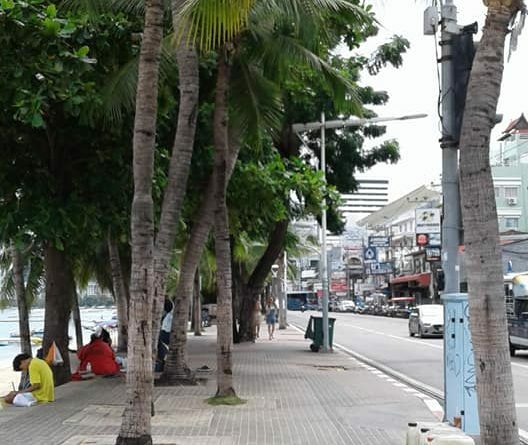 Since late July and into August 2018, Pattaya police have been active more that usual in conducting patrols along Beach Road from Walking Street to the lower Beach Road Sois, which is typically frequented by men and women looking to make arrangements for the night’s entertainments. In the past we have seen Pattaya police and military conduct operations to deter loitering on Beach Road and it is usual to see a modest Tourist Police presence at most times to ensure law and order. Earlier this month, we saw that some ladies have used the tactic of standing on the opposite side of Beach Road, amongst the parked motorbikes, shops and street food carts, perhaps going incognito or being more subtle about their business or appearing as just normal pedestrians until a potential customer makes an inquiry. It seems that this tactic has been employed by crafty operators in response to the ongoing police operations. The latest crackdown has seen more sustained operations conducted nightly and over a continuous period of more than 14 days now. We have seen large groups of uniformed police officers (commonly referred to as BIB, boys in brown) conducting patrols, walking the length of the beach on foot in order to interrogate people, supported by more officers with motorbikes. Reports online state that the police have implemented a new system of escalating fines designed to wipe out this behaviour. With Thai ID numbers recored in the police database, fines starting at 100 baht and increasing to 200, 500 or even 1000-2000 baht for subsequent repeat offences. This obviously represents a fairly large disincentive to most people who are caught and fined. Given that prices on Beach Road typically range under 1000 baht short time, this quickly makes the economic risk unviable. In addition the police are able to confiscate Thai ID cards which makes it difficult for the lady to work given that hotels check ID cards, and also it means she has to visit the City Hall to replace it or may even have to return to her home province to obtain documents needed. Illegal food vendors have also been targeted (the stall holders and also the motorbike stalls) with reports of vehicles being confiscated by police. At this stage we would recommend going to discos, to meet ladies or using one of the suggested apps in our guide to Pattaya. There are many ways to meet freelancers and sideliner girls in Pattaya, try using the links to look around at our guides. It is true that everything comes around in cycles in Pattaya, for example there was a crackdown last year. in July 2017. So it seems that these things happen from time to time and generally blow over. The great advantage of Pattaya is that even if one avenue closes, there are always others. So agogo bars, beer bars, massage places, discos, soapy massages and so on. Even if Pattaya were to be difficult, why not take a break for a day or two and visit Bangkok or Chiang Mai? Chiang Mai in particular is a good source for sideliner girls, local Thai students who are freelancing part time.